Everything revealed here has worked for me and improved my reloading process to varying degrees, or helped correct an issue I was having, but may not work for you, or be something you want or need for whatever reason. I hope to provide some insights and solutions for a variety of issues that will help you reload more successfully. My LM now is operating flawlessly, and I’m finally able to use it as a true progressive-press, but it took a lot of effort to get there. Some of these mods require special tools, electrical know-how, and the purchase of parts. I have tried to be as thorough as possible, but may call something the wrong name, or put something in the wrong order here or there, or a source-link may be wrong or broken. The photos posted will usually be shown following their description and you should be able to figure which goes with what. Make use of these modifications and suggestions at your own discretion and let me know your thoughts. Also feel free to PM me for more details or clarification. Hope this helps and be careful out there. 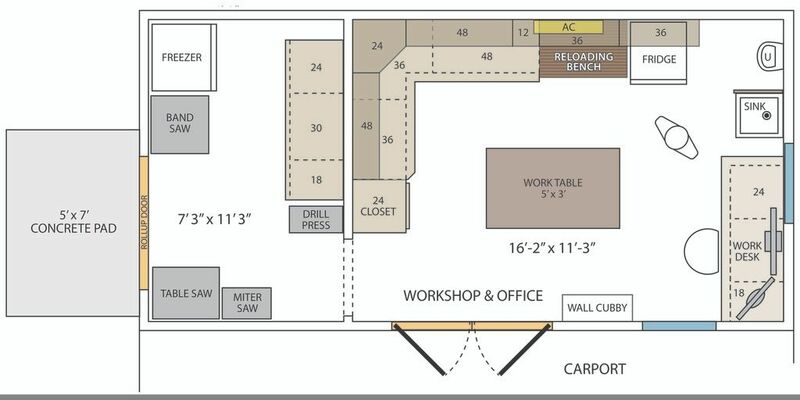 Last year I designed and built a new detached shop and carport, and in that shop would be a new reloading bench specifically designed for my “tricked-out” Load Master. I took my time designing the bench over a couple of months (in scale with Adobe Illustrator drawing software) and considered and addressed all known elements; the press, its riser-mount, lighting, wiring, storage areas, press parts and supplies, powder storage, materials, fasteners, the surrounding floor, wall and ceiling spaces, and wall-stud locations. The structural design would make the bench as strong as possible to eliminate any flex or shake, and the esthetic design would make the LM both ergonomic and efficient. After several revisions, I was satisfied with the plans (shown below), then gathered all the materials, made the cuts and started bolting everything together. The benchtop is a 1-1/2” thick maple butchers-block remnant (from Lumber Liquidators) that worked for the designated space (40” wide x 35-1/2“ tall x 25-1/2” deep). 3/8“ x 6” lag-screws & washers were counter-sunk through it and into three 4x4 solid maple legs on the front and three 4x4’s in the back. The counter-sunk spaces around the bolt heads were filled with clear epoxy to be level with the benchtop. The legs were supported on all sides with 2x6’s at the top, 2x4’s around the middle and bottom with 3/8” x 6” carriage bolts and washers (some bolts were longer or shorter depending on the pieces). The footers are anchored 3“ into the concrete floor, using 3/8” x 5“ Tapcon bolts, and the back is also lag-screwed in several places into the three wall studs. On the lower right are two 12” x 24” open plywood shelves with side-rails for storage, and an opening on the left for a rolling file cabinet, for powder storage. The benchtop is level with and butts against a section of workbench (which determined its 36-1/2“ height). I just finished building this in January, and it couldn’t be more stable. - ARS Primer System Mods for small and large primers (the rubber band is size #12). - Billet Turrets are milled from solid blocks of aluminum. - Turret Stabilizer Plate locks down the turret and dies. - Collator Mod Tips from his website worked like a charm, and better than the “washer/penny-trick” I was using before (2“ fender washer and a 1/4“ x 2” bolt, and 1/2” I.D. x 5/8” clear vinyl tube segments inserted as hole-reducer bushings... great tip Mr. Mike!. - Ejector Plate Punch Tip is a previous post of Mike’s that tightens up the ejector plate so it doesn't move at all, which improves indexing. - Shake Brake: My new bench is really steady now, but I may add this later. I purposely positioned the press on the bench so the Shake-Brake leg would not block access to the storage areas or powder cart. I stumbled on and bought InLine’s 3-part LED press lighting system a year and a half ago, then decided to use their press-mount system and other products when building the new bench. These top-quality products make for a much more comfortable and reliable reloading environment. - Load Master Roller Handle is absolutely incredible, much more comfortable to use than the wood ball, and my favorite product from InLine (I highly recommend this to all LM owners). I put 2 layers of thick 1-1/8“ rubber heat-shrink tubing around the plastic handle for a softer feel, ground down the length of the 3 set-screws about 1/16”, so they were counter-sunk (they initially stuck-out past flush, and were kind of sharp), and then blued and oiled those ground edges. The handle could be installed on either side, and I initially put it on the left so it was closer to the center of the press, but that pushed me over to the left side of the press, so then switched it to the right side. The ball-bearings are tight and there was no slop in the handle, a rock solid and super upgrade. - Quick Change Press Mount: Talk about making a stand! This 3/16” thick steel riser and even thicker 3/8“ swapable mounting plate are 10-1/4” tall, and really help with press-lever to hand and arm ergonomics (the lever’s pivot is now almost level with my elbow). It also allowed me to not worry about the LM’s ram hitting anything below it, and to have 1” of benchtop overhang. I played with where to set the mount and decided to put it to the right of the middle leg to have extra bench area on the left, and allow room for adding a “Shake-Brake” later, if needed. The base sits back 1-1/2“ from the front of the bench. Its front bolts go through the 1-1/2” benchtop and the middle of the supporting 2x6, using two 1/4“ x 8” bolts and 1-1/2” washer. The rear of the mount is bolted through the benchtop with 2-1/2” bolts and washers (I used nylon lock-washers on all the bolts). InLine also offers a 6“ riser which would work well, as the LM needs just 4-7/8” of space for the ram to clear the benchtop. DRILLING TIP: To be sure I drilled down straight through the 7” of wood for the 8” bolts, I created a drill bit guide-block by drill-pressing a 1/8“ hole through a 4” scrap of 4x4. Using the guide-block, I drilled a 1/8“ guide-hole through the benchtop and 2x6 with a 1/8” x 12” bit, then followed that hole with a 1/4” x 12” bit. The 2 holes were dead-center at the bottom of the 2x6. You could also use larger guide-blocks to start the guide holes, then switch guide-block sizes until you clear the 7“ of wood (almost as good as a drill-press). - Quick Change Top Plates: I ordered 2 additional top-plates that had specific beveled mounting holes for my Breech Lock Challenger press and large Wilton vise. On the Challenger top-plate I also used the Lee plate for extra strength. They have over 70 plate-templates listed, but you can get these plates for almost any press or tool by giving them measurements for the beveled mounting holes, or you can also just drill the holes yourself on a blank plate. - Benchtop Quick Change Mount is heavy-duty and installed on a separate table for my Wilton vise, and can swap-out the other mount-plates here if needed. - Wall Mount Plate Hangers let me move, swap or store any of my 3 mount-plates. On one I store and use my Challenger press and RCBS bullet-pulling die, the other for setting the LM away from the reloading bench, or to move the Challenger closer to the press when needed. - Universal Double Bullet Tray System bolts to the back of the mount and has a swinging double-arm that puts the plastic bins closer to the press and shell-plate. Pivoting on their bronze bushing, it easily swings out of the way when not needed . I did not use the included 3” riser and like how it’s positioned without it. - Press Lighting System: Their LED “Skylight” shines down on the shell-plate area through the center hole of the turret (you’d have to drill the center area out on a stock Lee turret, "magic mike’s” turret is already open there). Their two LED “Ceiling” strips brighten the area even more. I also wrapped the skylight with black silicon tape, which keeps it snug on the turret between the dies and doesn’t rattle. The included wire clips run the wires to the back of the press and then down the riser and through a small hole on the bench top. I spliced in bullet-connectors so they disconnect easily when the press has to be moved. I wired everything to a push-button switch just under the front of the benchtop. - Turret Storage Rack: A very secure and convenient place to set my 3 loaded turrets, mounted at the bottom of an upper cabinet door. There’s 3 holes for the turrets and 3 slots for shell-plates. - AKRO Bins and Barriers: I use 3 sizes of their red bins, both loose and on a wall-track. I also use several bin-barriers which allow full-use of the bin’s capacity. On the advice of forum member “carload9”, I contacted forum member “websterz” (Todd) about his custom case-feeder pieces, and then ordered them. He even went to the trouble to send me a video of my actual parts working on his press, before shipping them to me. It took a while to set these all up and fine tune them, but afterwards they made a huge improvement in reliable case-feeding. He uses spring-steel plate and aluminum on these parts, so nothing could be more rigid. PM “websterz” to order yours or for more information. - Aluminum Case-Slide Push-Block: I polished the block to reduce friction. - Case Tip-Stop is a spring gate that keeps cases from tipping over when they drop on the case-feed tongue. Last edited by THRASH on Tue Apr 12, 2016 1:43 am, edited 1 time in total. Wow, that is a great setup you have there! Very professionally done. Octopuss wrote: It's necroing, but I really would like to know what the two tubes coming out of the ram are. I believe they are for spent primers. Some people remove the slider door from the bottom of the ram and mount a tube up it that's epoxied into the bottom of the carrier to tunnel the spent primers through. The right-side tube is for "spent-primers" which goes up below the decap station and that tube empties in a container underneath the top. The left-side tube is for inadvertent "good-primers" that may jump out at station #2, but none have so far after my previous stated mods. These would just fall to the bottom of the tube & could be seen to re-use.